Now also available online, the Dictionary of Qur'anic Usage is the first comprehensive, fully-researched and contextualised Arabic-English dictionary of Qur'anic usage, compiled in accordance with modern lexicographical methods by scholars who have a lifelong immersion in Qur'anic Studies. Based on Classical Arabic dictionaries and Qur'an commentaries, this work also emphasises the role of context in determining the meaning-scatter of each vocabulary item. Illustrative examples from Qur'anic verses are provided in support of the definitions given for each context in which a particular word occurs, with cross-references to other usages. Frequently occurring grammatical particles are likewise thoroughly explained, insofar as they are used in conveying various nuances of meaning in the text. 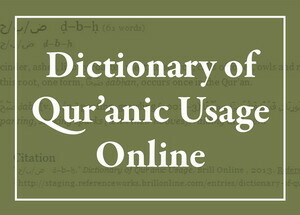 The online version of the Dictionary of Qur'anic Usage is full-text searchable in Arabic and English.